The more I am looking at this picture, the more I am liking it. Eveything is so geometric, neat and colorful. 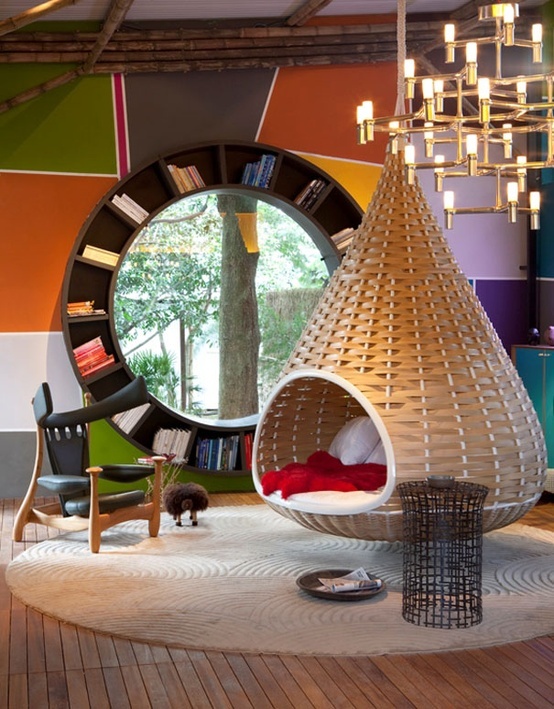 The color-blocked wall , circular bookshelf with a window seat and an amazingly awesome view, cosy hanging swing, bamboo sticks, chandelier, the quirky chair....what not to like. The place is so vibrant and spells happiness.I Would love to have a place so quirky yet so happy. All it needs is a fireplace and then it'd be my kind of perfect! Thanks all for the lovely comments!!! !